‘Trump’s rise may seem unprecedented but it has past echoes’ writes David Black. ‘The Immigration Restriction League of the 1880s sought to defend white Protestant values by reducing the inflow of Irish, Italian, and Polish Catholics’. This was about racism, but also about Liberal self-delusion. November 8 2016, 6.30pm Eastern Standard Time, and the happy faces at New York’s Javits Convention Center said it all. History was in the making as America prepared to greet its first female president. The crowds lining up outside were primed to celebrate. ‘She’s in with a landslide’ said one excited lady to her friend, who joyfully agreed. Exhausted looking Clinton aides were handing out flags in anticipation of the explosions of joy which would greet the incoming results. The warm-ups from Mayor De Blasio, Governor Mario Cuomo, New York senators Chuck Schumer and Kirsten Gillibrand, amongst other big-hitters, were rich in the predictable American rhetoric about hard working parents who had sacrificed their all to give those speaking on the platform the education which had put them where they were. Donald Trump’s running mate, Mike Pence, had made an almost identical speech a few months earlier, extolling the same brand of maudlin’ Lincolnesque log cabinism which ostensibly delineates the speaker’s folksy ordinariness. We tend not to do it that way in Britain. It’s one-size-fits-all stump rhetoric for almost every American politician, though an exception was made for Andrew Cuomo, son of and campaign manager for a former New York Governor. The veneer of privilege did not stop him from coming up with the weird command that everyone should hold up their hands to feel the spirit of his late and much respected father, Mario. The tone, needless to say, was mercilessly up-beat. There were fulsome and volubly sincere testimonials to the professionalism and commitment of Hillary Clinton. The flag wavers cheered. It was a victory rally recalling UK Labor leader Neil Kinnock’s fatally premature 1992 Sheffield declaration of triumph. That, too, had been a prelude to disaster. This time around no-one seemed to be asking an obvious question. Why had the Clinton campaign chiefs decided to call off the fireworks display set up on the other side of the Hudson? ‘Safety reasons’ suggested one fresh faced hopeful. But did the party pollsters know something the rest of us didn’t? For that matter, did they know something every other pollster (with one exception) didn’t? All the buttons were pushed. Khizir Khan made a dignified speech about his love of the American values his son had died in Iraq to defend. The mothers of young black men shot in police incidents were brought to the microphone. There was a frisson of excitement and a surge towards the stage for Katy Perry – today’s American values would seem to rank a selfie with a pop singer in the background alongside social justice, patriotism, and freedom of speech – but even the enthusiasm of an A-lister couldn’t conceal the growing anxiety of those who were keeping an eye on the overhead screen. To the horror of the assembled crowd it became painfully apparent, by degrees, that a Trump rampage was underway. This was the point at which the brakes in the slow car crash began to fail. The jaws were dropping, the faces turning ashen-white with disbelief; then the emoting began as the faithful hugged each other in tearful sorrow. They had come to praise their Caesar. Now she was being buried. As midnight approached the morose and the dejected drifted away, leaving others to clear up their litter. It was all over. Donald J Trump was going to be 45th President of the USA. A few paper stars and stripes had been discarded. The country had let them down, after all – indeed, it must have seemed to many of those heading for home that it was no longer their country. The benefit of hindsight is a wonderful thing, but it must be said that the flaws and weaknesses in the Clinton campaign were glaringly obvious from the start. Her support base, on the whole, was stuck in a self-delusional comfort zone in which one truth, above all, was held to be self-evident. She was much more experienced and qualified than her rogue rival, a congenitally unpredictable and unashamedly crude maverick. Decent, wholesome Americans couldn’t possibly vote for him in large numbers. Like gravity, it was an incontrovertible fact. Only it wasn’t. One of the more bizarre moments of self-delusion I witnessed was at a meeting in Greenwich Village held by the left-leaning Nation magazine. This consisted of perhaps 200 people sitting in a room, all of like mind. A moderator led a discussion with a panel which, while carefully balanced in terms of race, was all-female. A well dressed elderly Sikh gentleman a few seats along the row from me dozed off during a long shared monologue about the imminent shattering of the glass ceiling. Questions from the audience were required to be submitted on cards, a sly old ruse which allows the tricky ones to be filtered out. There was an awkward moment at this liberal love-in when the matter of the polls came up. Why were they so close? One panelist had the answer. The wives of Trump’s redneck white male supporters were going along with their menfolk to keep the peace at home, but once in the polling booth most would be voting the same way as their college-educated sisters, alienated by Trump’s uncouth misogyny. Such a comforting illusion. In the event, it seemed to be college-educated white males who’d been quietly keeping the peace at home. 54% of them opted for Trump; a mere 39% for Clinton. Even the anti-Trump Latino vote was less than rock-solid, casting around 30% of their ballots in his favour. 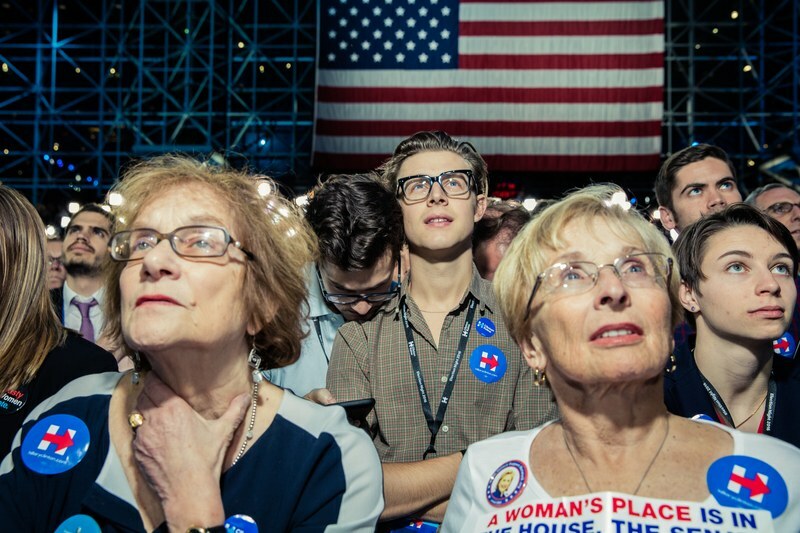 In The New Yorker, just a month ahead of the election, Larissa MacFarquhar had reported from West Virginia on the true feelings of Hillary’s ‘basket of deplorables’ where even a man running for state senate as a Democrat in Logan County – where more than 20% of the population live below the poverty line – was going to be voting for Trump in a coal-producing state which, until 2000, was solidly Democrat. ‘We built this country with the steel that came out of our coal, and we protected this country with our soldiers, and nobody cares – that’s why West Virginia is going to vote for Trump’ he predicted. America’s liberal establishment has been in denial, its adherents having failed to cotton on to the irony that they were the conservatives now, while super-rich Trump, the unlikeliest of people’s champions, was the radical. Hillary, the continuity candidate, could never repeat the call for ‘change’ which characterized the 2008 ‘Yes we Can’ election. 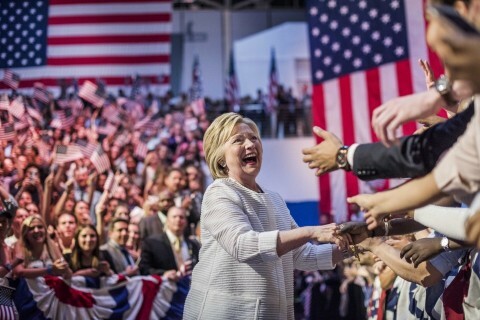 She was the ‘no change’ candidate, after 30 Bush-Clinton years in a political machine which for many disenchanted Americans was tired and sclerotic. There are parallels, too, with the 1828 election of tub-thumping populist Andrew Jackson – otherwise ‘King Mob’ – who brought an end to the Jeffersonian era after defeating the dynastic conservative incumbent, John Quincy Adams. Then, too, there was much establishment queasiness at the demotic horrors which might unfold under the presidency of a man who still ordered whippings for his slaves and whose Indian removal policies led to the infamous Cherokee trail of tears. Then, as now, a rank outsider became President of the United States when it wasn’t meant to be in the script. Inevitably, Donald Trump is a much bigger danger to the world than Jackson could ever have been. He has claimed that climate change is a ‘Chinese hoax’ designed to hobble American industry with regulation, and has vowed to pull out of the 2015 Paris Climate Agreement. He has said he would contemplate using nuclear weapons in Europe, and now has access to the nuclear codes. Attempts are being made to alleviate the gloom. He’s not much of a micro-manager, hazard some, so policymaking will be left to others. A deal-making populist, his concern will be to remain popular, so he will moderate his behavior and his language. He may have suggested ‘punishment’ for women who have abortions, but in some ways he’s quite socially liberal, runs one line of thinking. Alan Greenspan, an anti-Trump conservative to his bootstraps, hopes that Trump, the actor, having strutted in his role as renegade, can learn his lines as President and turn in a Reaganesque performance. There is also, perhaps unusually for America’s media, a growing awareness that events in the USA are part of a global trend. Trump’s victory is now widely compared to Britain’s surprise Brexit vote. Pundits also cite upsets in Europe which seem to reflect a new mood, whether on the left, as in Greece, where the radical Syriza coalition seized power from the once unassailable centrists, or on the right, as in France and the Netherlands, where the National Front’s Marine le Pen is no longer being written of as a possible future French president, and the Eurosceptic anti-Islamist Geert Wilders is tipped to gain the largest number of seats in the 2017 Dutch elections. In Italy, meanwhile, the 5 star party of comedian and satirist Beppe Grillo picked up more than 25% of the votes in the 2013 general election. 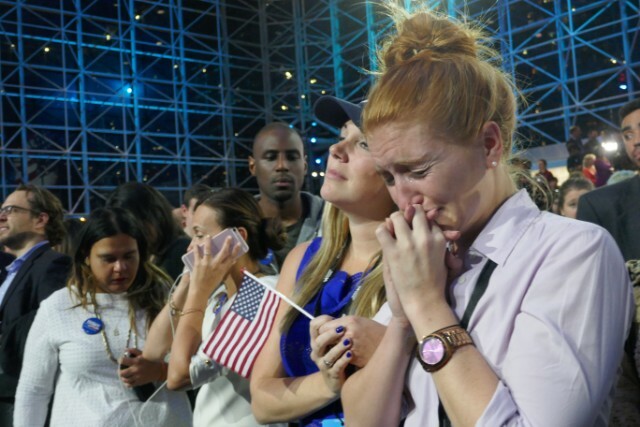 It would seem that the abject liberal despair which manifested itself at the Joseph Javits Convention Center on election night is becoming a mood of abject resignation for many of those on the losing side. For one thing, the markets don’t seem to have crashed, the dollar is holding up, and the birds are still singing in the trees. Besides, Trump did promise to protect American jobs, especially in the rust belt, so maybe things won’t be so bad after all. That was the hope of a dyed-in-the-wool leftist friend who was desperately trying to take a glass-half-full view. I’d last seen him on election night, when he was heading for an event being held by his not-for-profit employer, and he’d been in a decidedly upbeat frame of mind. ‘We’ll have one room with the champagne on ice, but – just in case – we’ll have another room with Kool-Aid laced with cyanide.” He’d joked. ‘Still here?’ I remarked when I’d bumped into him two days later. It was good to see he’d retained his old sense of humor. He’s going to need it. The mass rioting and racist violence against white people by left wing fascist extremist Hillary supporters was shameful to watch. Its one thing to be a poor loser, but quite another to drag random white people out their cars and beat them to a pulp and leave them for dead. Trumps has promised to dismantle NATO, scrap the dreaded TTIP, and is the first president ever to scrap his own salary of $400,000. Hillary would not do any of these things. He is a change candidate, and not all of his changes may be successful, but anything would be better than a Hillary presidency with her support for ISIS and orchestrating a civil war in Ukraine. good essay. encouraged to read some evidence that the Clinton regimen of women are wakening up to the reality. bit too late. the metro “liberals” should now realise that the folks in the sticks also have brains – and votes. Got as far as the standard Putin bashing shite and gave up. So to be concerned over Trump you have to be pro Clinton and everything she stands for? She, or rather her handlers have been responsible for a swathe of death and destruction, utterly disgusting to any decent person, but we’re supposed to be impressed with vague “right on” support for “liberal causes” such as LGBT issues (and I say this as a Gay man). I don’t care if she’s in favour of Gay marriage if she’s also in favour of wholesale murder of people in the Middle East for Geopolitical reasons she deserves to be in Jail for war crimes not in the White House. A polished view of the slo-mo catastrophe that is the US political response to eight years of fettered governance at a time of economic crisis. If Trump decides to mess with the solidly reflationary policies of the Obama era, it will precipitate a western crisis of biblical proportions. Like all US elections, it is always the economy, stupid. And a failure to seek effective ways to maintain economic prosperity can only fuel a further drift to the right. Keynes said it most succinctly: in the long run, we are all dead. So what are Trump’s economic goals? As US democracy dies on its arse I wonder what Francis Fukayama makes of it all? Time for a re-write maybe.